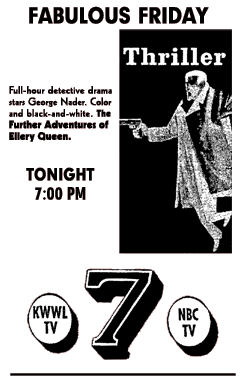 You could watch Ellery Queen on your television throughout the 1950s. Most of the 168 episodes seem to be lost, but some can still be found online. I don’t really recommend them, except as historical curiosities that feature Ellery Queen, at least in name. The television series can be easily broken down into four components. The first was The Adventures of Ellery Queen, which ran for 50 episodes on the Dumont Network from October 14, 1950 – December 6, 1951. The following week, December 16, 1951, The Adventures of Ellery Queen switched over to the ABC network, and ran for 43 episodes until November 26, 1952. ITC featured a show starring Ellery Queen called Mystery is My Business for 32 episodes from 1954 – 1956. Lastly, The Further Adventures of Ellery Queen ran for 33 episodes on NBC’s 1958-1959 season. Apparently, several of the episodes were based on the novels The Door Between, Ten Days Wonder, Cat of Many Tails, Double, Double, The King is Dead, and The Glass Village.